It's early, and the light is bad. But I am putting perfectionism behind me for awhile today, and have lit a candle for courage. Maybe you have read a bit lately of the "hygge" concept. If not, here's a nice link to clue you in. I thought about the idea a lot this morning, and think it's a great notion for our times. There is always so much to share, and so little time. My big idea moment of the day is often first thing in the morning when I am just waking up and starting my brain going with a nice cup of something and a browse. I used to get energy and inspiration from magazines first thing, but the internet has augmented that these days. (For good or ill.) In a lot of ways these resources are still finding themselves and their relationship to each other, but it seems that for now decorating magazines have turned heavily to blogs for sustenance. A while back magazines weren't faring so well. But they have had such a resurgence that you can't keep up. I mean, there are so many now that no one can afford to! But I am limited more by common sense than money these days where that's concerned. I subscribe to no more than two publications now, and cherry pick from the rest. I spend a lot more time making my selections than ever before, and buy a mere fraction of what is offered, yet I still seem to get a ton. We dish out for a single issue now what we used to spend for a book, so I choose more carefully. I also pass on the issues that I am finished with, and hang on to piles of all the rest. That alone presents challenges of its own. Where to keep all those magazines! This issue is one of the very few that I chose for fall. They can all end up looking the same to me. Notice that it is "the best of", so you may have already seen some or all of it. And not cheap. I enjoyed the whole issue, but this article caught my eye enough to look up the artist, David Arms. I could tell by this book room that we have a few things in common. I always read with a magnifier, and you would be shocked at how much more detail that you pick up. Besides the whole aesthetic of the family rooms, one of the things I liked best was the magazines stowed behind the couch! He loves what we love. A lot of bird themes, transferware, and wonderful quotes. There is original artwork for sale, but I won't be investing in any yet. Fortunately there are greeting cards and other things for sale that you can have for a lot less! But just looking over the website will feed your soul. "Now tune in some classical music, fill your space with my "studio" scent and come on in." So I lit a favorite scent of my own, and did just that. Stop by the site and tell me what you think! These days I always read a magazine with my laptop at hand to look things up. Lots of our friends are in magazines lately too. I don't think that I will be giving up the printed page anytime soon. Now all I have to do is figure out a few more strategies to deal with all my past issues! P.S. I wanted to leave a word of thanks for all of the wonderful words of encouragement I got in the comments and in email after my last post. They warmed my heart, and I am still getting back to many of you. Thanks so much for all the love! I've been really stressed out lately, as many of you have. And by "lately" I probably mean most of the last year. I have often felt distracted from enjoying things like posting on my blog, and haven't been feeling very creative. Sort of slogging through in slow motion. I think I have started to unload on you here! But all I mean to say is that there are parts of my life that are constant in the chaos, and I want to keep sharing them with you because they are a solace and a help to me. Besides the obvious things that folks turn to, like faith and family, I also turn to simplicity, and the ordinary joys and beauties that can bring a small lift in a dark time. I'm pretty sure that this is where the tradition of giving flowers comes from. But one of my big soothers is working with freshly laundered linens, and ironing. It gives me a way to reorder the world. And you might also be surprised at how calming going through the motions of it can be. Cooking, knitting, gardening, or writing might be what does it for you. I have also been cleaning out closets for a long time now, and giving stuff away. These are some of the linens that I have had tucked away for awhile. They are a small cache of antique monogrammed towels that have been kept from use over generations of time. Still in new condition. I am sure that for some of these samples, mine was the first washing they had ever had. 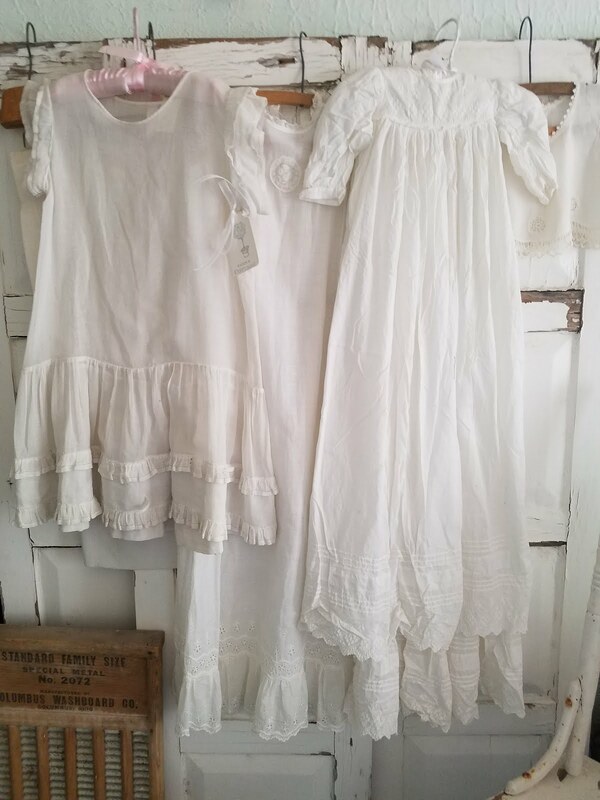 Some I will give away as gifts, but there is so much pleasure in using old linens in exactly the way they were originally intended, that I will keep some for use myself. Here is a stack of three hefty linen towels with my own first two initials on them! I also take pleasure in the hunt for interesting old vintage things. I bet that's a stress buster for a lot of people! These old shakers are a nice homey addition for my pretend farmhouse kitchen. I recently went looking for new fall decorations for the shop, and found silk flowers half off at the hobby shop. I don't keep many faux flowers at home, but I was surprised to learn how much these imitations cheerily fooled my eye! I have them plopped in an old vintage florist's basket. I know that white doesn't do it for everyone, but white is my high energy and peace color. Silver is also a fall and winter thing to me, and I was happy to find a pretty new vintage ladle for all of our cold weather soups and stews. The platter is perfect for the holidays ahead, and I had been searching for one just like it. The vintage pewter candlesticks will never even need a polishing! All recent finds. So that is about as creative as it gets for me these days. On one hand, it is about as shallow as life can get. On the other, it is about sharing some of the upside, and the good things in life that could easily be taken for granted. About keeping on, and keeping contact. Keeping connections in a sometimes seeming disconnected world. So I will share what I am up to these days even if it is nothing very special, and I hope that you do too.